CultLab3D is the first automated 3D mass digitisation pipeline for cultural heritage artefacts in the world. The technology developed allows to significantly shorten the time of object digitisation, down from several hours using conventional 3D scanning methods to mere minutes per artefact. The research project was initiated by the Competence Center for Cultural Heritage Digitization at Fraunhofer IGD and funded by the German Federal Ministry for Economic Affairs and Energy with the support of internal strategic investment funds of the Fraunhofer-Gesellschaft. Fraunhofer IGD was also former technical coordinator of the EU project 3D-COFORM. CultLab3D was concerned with implementing an encompassing approach to 3D mass digitisation, annotation and archival storage of three-dimensional objects as a logical progression from “2D” artefacts, largely found in libraries and archives. 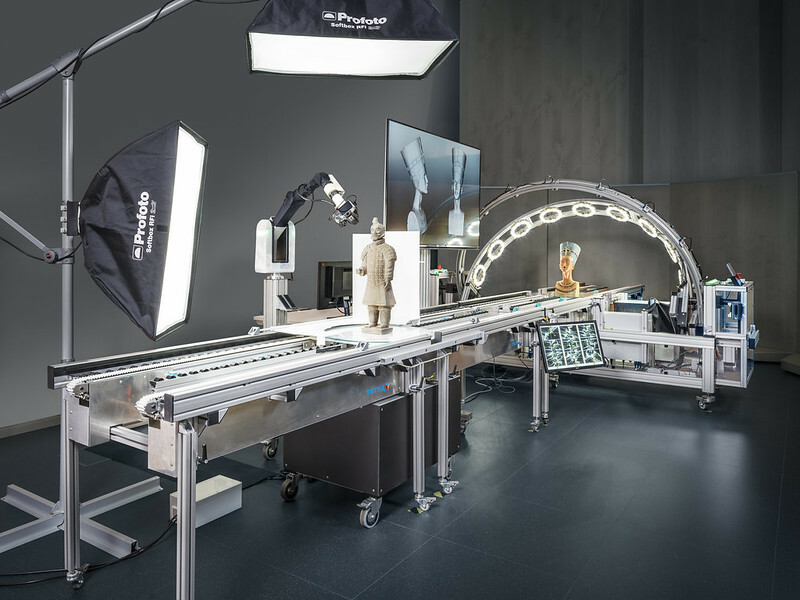 It was specifically designed to automate the entire 3D digitisation process and thus scan and archive large amounts of artefacts, such as sculptures, busts, zoological and archaeological remains, or even everyday objects in cultural-history museums, in an efficient manner with high-quality results. “Geometrically accurate 3D documentation technologies and innovations in photo-realistic digital representations of historical artefacts enhance our tools for the long-term preservation of cultural heritage, overcoming the limitations of conventional two-dimensional documentation techniques. They allow for new ways of scientific exploration of the past, radical new forms of interactions in the present, and furthermore provide resilience for museum collections in the future, counteracting the loss of cultural heritage in multiple ways. The CultLab3D project is a strong example of such a technical innovation. It provides a time-cost effective solution for the scanning of artefacts at different scales thus serving the long term preservation of cultural heritage”, the Jury stated. A web-based 3D-centred annotation system for object classification links the art historical, cultural and provenance background information to the object and provides global access to the content. This in turn presents a new method of study, opening new prospects to museums around the world. As CultLab3D approaches the digitisation of artefacts on a large scale but in a cost effective way, the project makes a significant contribution to the main aspects of the European Digital Agenda and is in line with the European Commission’s call to cultural institutions to increase their efforts for digital availability, online accessibility and digital preservation of historic material. The Jury applauded the project for “providing the technology for the creation of virtual collections in the future, especially in the context of the recent destruction of cultural heritage at an unprecedented scale, and for giving access to objects which are not publicly available– either due to the limited accessibility of collections or for preservation reasons”.